Mishka opened the door to the stairwell, but then paused. Having taken a moment to look over the kitchen with all of its activity and abundance, to look from gentle Andrey to heartfelt Emile, he turned to the Count. At five o’clock on the twent-first of June, the Count stood before his closet with his hand on his plain gray blazer and hesitated. In a few minutes, he would be on his way to the barbershop for his weekly visit, and then to the Shalyapin to meet Mishka, who would probably be wearing the same brown jacket he’d worn since 1913. As such, the gray blazer seemed a perfectly suitable choice of attire. That is, until one considered that it was an anniversary of sorts–for it had been one year to the day since the count had last set foot outside of the Metropol Hotel. But how was one to celebrate such an anniversary? And should one? The Count’s world has shrunk to the size of the Metropol because he has been placed under house arrest there, declared a “former person” for writing (or so the authorities think) a poem judged counter-revolutionary. The central conceit of the novel is that the hotel is at once a microcosm of the larger world from which the Count has been banished and a shelter from it. The small attic room that becomes his quarters when he is displaced from the luxurious suite he once occupied is “without question, the smallest room that he had occupied in his life; yet somehow, with those four walls the world had come and gone.” People of all kinds pass through the Metropol and become his acquaintances, friends, and allies, even though he is now the head waiter in the hotel’s fine dining room rather than a celebrated guest. Watching these relationships gradually knit together into a subversive conspiracy delicately orchestrated by the Count is one of the many pleasures of the novel’s final section. Before he, or we, can get to that point, there are decades to pass in which the Metropol’s front door remains (with one dramatic exception) an impassable threshold. 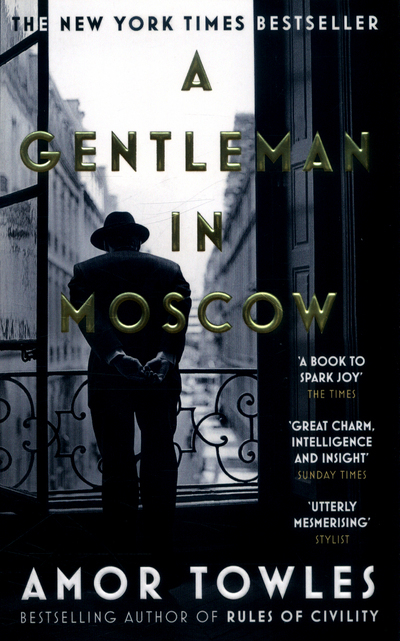 They are turbulent times in Russia (the Count is escorted back to the Metropol for his imprisonment in 1922, and the novel ends in 1954); one of the most interesting things about A Gentleman in Moscow is how thoroughly but also how indirectly, almost glancingly, it engages with the events of this period. Even as we, along with the Count, are constantly reminded of how much the world outside the hotel is changing, he is by fiat, and we are by art, always at one remove from events. World War II happens entirely off-stage, for example: the novel jumps from 1938 to 1946, though it pauses there for two retrospective pages on Operation Barbarossa, from Hitler’s ambitions to “secure Moscow within four months” to the Germans’ chastened retreat from the outskirts of Moscow in 1942. Let us concede that the early thirties in Russia were unkind. In addition to starvation in the countryside, the famine of ’32 eventually led to a migration of peasants to the cities, which, in turn, contributed to overcrowded housing, shortages of essential goods, even hooliganism. At the same time, the most stalwart workers in the urban centers were wearying under the burden of the continuous workweek; artists faced tighter constraints on what they could or could not imagine; churches were shuttered, repurposed, or razed; and when revolutionary hero Sergei Kirov was assassinated, the nation was purged of an array of politically unreliable elements. Nina had not contented herself with the views from the upper decks. She had gone below. Behind. Around. About. In the time that Nina had been in the hotel, the walls had not grown inward, they had grown outward, expanding in scope and intricacy. In her first weeks, the building had grown to encompass the life of two city blocks. In her first months, it had grown to encompass half of Moscow. If she lived in the hotel long enough, it would encompass all of Russia. Nina does not, ultimately, live in the Metropol that long, and certainly not as long as the Count, but her lessons transform the Count’s experience, as does the very different legacy she later bestows on him in the form of her daughter Sofia. And it is Sofia who, in her turn, finally motivates the Count–this “proper, proud, and openhearted” man–to carry out his own personal revolution against the diminished life he has not just endured but done his best to fill with meaning and small moments of rescued beauty. I enjoyed this novel and reviewed it last May. My son, however, a Russian major headed for a summer in Siberia, didn’t like what he read of it at all and said it was “not Russian” and that the author did not understand Russia very well. I wondered about that at a couple of points, especially during the conversations explicitly about the “Russian identity,” which felt a bit canned to me. On the other hand, I wonder if it really is possible to “understand” a nation in any kind of sweeping yet consistent way. I thought (though I have no expertise to back this up, of course) that he captured a certain idea or mood about pre-Revolutionary Russia well, or at least evocatively, which I guess is an aesthetic judgment rather than an epistemological one. The novel did remind me that I still haven’t read War and Peace and really should. War and Peace is Walker’s current favorite novel, so it may give you the same ideas about Towles’ novel that it gave him. I went back to reread your post (reading it I definitely recalled having read it last year when you posted it) and what I especially like about it is that you did not read the novel really literally as “about Russia.” I mean, it obviously is about Russia, but perhaps Russia is (also) functioning as a device? Also, I wanted to say something here about Casablanca but didn’t: I really liked the way Towles used it as a touchstone text. True, but a novel with footnotes and an overt interest in understanding / explaining both Russian history and the Russian character (or, the character of Russia). So it seems fair to consider how well Towles might have done at that. There’s always that problem with historical fiction, though, I agree: how much does presenting history as fiction free an artist from the obligation to get things right (whatever that means)? Thanks for this review, and for the excerpts. I’ve wondered about it since it’s so widely praised and loved, and the library hold lists go on and on. But I think it would make my head explode. The bits you quote definitely tip over into “twee” for me, with a helping of “self-indulgent prose which loves itself too much.” And if I took it seriously I’d have a lot of trouble with the tragedies of the Soviet Union as a backdrop to a supposedly classy aristocrat’s musings about life. There is definitely something self-indulgent about the novel, though I wouldn’t necessarily have said it was the prose (which by and large seemed restrained to me)–rather, a nostalgic investment in ideas about aristocracy and (as you say) class, with peripheral assumptions about culture, the arts, and associated value judgments. 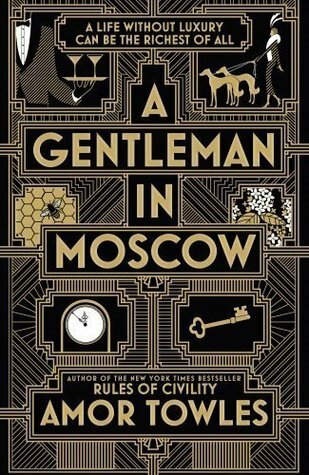 Almost finished the novel and, as a russian myself, I would say that Russia, as a country, plays role a fictional theatrical back drop there, looking pretty but being just a painted canvas. For some reason I’ve got the notion that Amor Towles continues to explore there the idea of loneliness of the man in our world, the idea that was addressed in his first novel, “Rules of Civility” with Tinker character, where “Walden” of Thoreau has been constantly mentioned. Towles needs post-revolutionary Russia to set-up the stage of the “solitary confinement” of the main character, to establish routine and simple pleasures of existence. it is an exotic place, anything can happen there. Fantasy can run free! To my liking though, he’s not going too deep into philosophical side of created environment. It almost calls for Tolstoy or Dostoevsky to try the depth of the scenes, but Towles stays in quite shallow waters. I had the same feeling with “Rules of Civility” – one perfectly arranged scene after another, they fall short of exploring them and draw a possible moral conclusion. I might be mistaken and such pull towards stoic philosophy of the characters is not on the mind of the author, but there is always a hint in the air that something important about the life in general will be revealed, there is a second layer to everything and… nothing happens, at least so far. Great story but not utilized to full potential.